Be Prepared for Emergencies & Blackouts! CELEBRATING OUR 15TH ANNIVERSARY! APRIL FREE GIFT WITH PURCHASE: THE SUPER PVA HANDY SHAMMY - GREAT FOR COOLING OFF - YOURS FREE WITH A CONSUMER PRODUCT PURCHASE OF $49.95 OR MORE. Get Prepared For Power Failures, Storms, or Unexpected Disasters! Here in Chicago, we have an unusually high number of power failures. So, our staff has first-hand knowledge of how these products work! Check out our new emergency L.E.D. 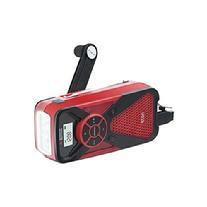 flashlights, cell phone chargers, AM/FM/Weatherband radios, and leak alert detector. Most models feature wind-up cranking that requires no batteries. Some feature alternative charging using solar power, batteries, DC transformer, or USB adapter. All products have a 30-day unconditional money-back guarantee. Order as much as you like since flat fee shipping is only $9.50 per order for Consumer Orders shipped in the 48 mainland United States. Flat fee shipping is also available for Consumer orders from Canada and foreign countries at reasonable rates. Please click here to become a Dealer. To learn more about our products, simply click on an image or select from the menu shown on the left. We are proud members of the Elmhurst Chamber of Commerce. A Company that Values and Respects its Customers, Vendors, and Employees.